Susan Johnson Moved 15 Times in 17 Years, Living In A Tent At One Point. Now She Has A Home. A Very Small One. SOUTH DENNIS — If Susan Johnson were the jealous type, the view through her camera lens might make her weep. Look straight ahead at the hand-cut limestone counters. The limestone tiles. The limestone shelves. Look to the right at the walk-in closet big enough to fit two queen-size beds. And left through the window at the golf course outside. The room you’re looking at is the bathroom. Johnson is here at this Mashpee gated community to photograph a home that’s on the market for $1.2 million. The bathroom alone is worth about $10,000, says the development’s sales director. “This area is bigger than my entire house,” says Johnson. 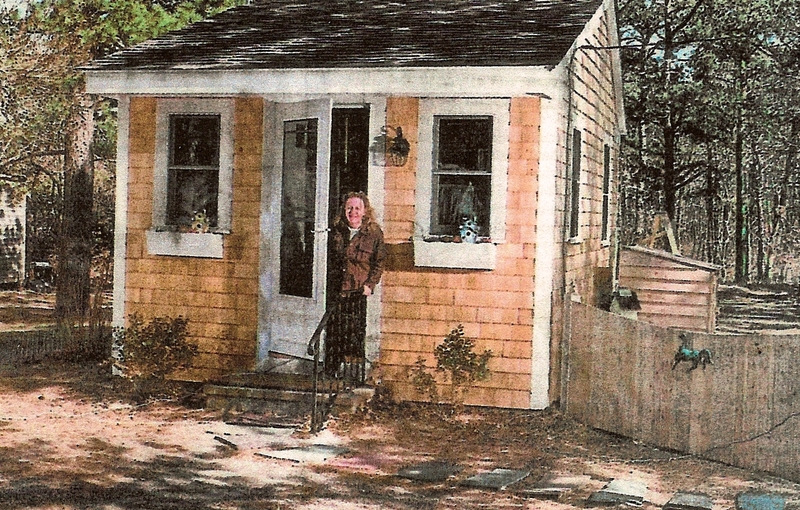 Such is the yin and yang of a typical day in the life of Susan Johnson, the owner of what just might be the smallest year-round house on Cape Cod. Johnson, 57, spends her days photographing some of the region’s blockbuster homes. Her pictures get stitched into virtual tours and posted on real estate Web sites. But at night she and her Jack Russell terrier, Good Boy, return to something smaller. Much smaller. Johnson lives in a fairy-tale house that a local once quipped looks like a closet on a lot the size of a postage stamp. Maybe. But after sleeping in a tent as a homeless single mother with two kids, after moving 15 times in 17 years, and after watching the Cape’s housing prices rocket to unprecedented heights, buying that postage stamp last year made Johnson a homeowner for the first time. She had given up. Now she has a house. “This is my palace,” she says, reclining on a lawn chair outside her golden-shingled home. Her palace, which cost $118,000, stands on a quarter-acre lot at the corner of Airline and Old Chatham roads in South Dennis. Little things fill every inch of it. There are little chairs (two knee-high stools), a little bed (youth-sized mattress), and even a little cat (named Little Black Cat). The house’s one room – except for the bathroom, its only room – measures 15 feet 3 inches by 11 feet 4 inches. A Hummer measures 17 feet by 6.8 feet. A Jacuzzi in the Plaza Suite at the Hyannis Cuddle & Bubble Inn measures 7 feet by 5 feet. A cell at the new Barnstable County jail is 10 feet by 8 feet. It’s so small that a housing agency told her not to apply for a first-time homeowner’s program, which would have helped with closing and down payment costs, because the property didn’t meet the minimum specs. It’s so small that Johnson heats it with a propane stove, has her dog and cat share a water bowl, and sometimes stores CDs in the dish rack. And beyond the limestone bathroom, there’s a lot to admire in this Mashpee home today as Johnson sets up her camera in the living room for another shot. The cedar-shingled home is among the smaller of the 250 scattered throughout the golf course at the Willowbend Country Club. The house is laid out Florida-style, with few doors. Captured in Johnson’s lens is a continuous plane of red oak hardwood that stretches across the living area and breakfast space. And beyond that – the kitchen. It boasts a professional Viking stove, granite counter and a refrigerator camouflaged with a custom-fit wooden panel. Also, the wine cabinet is built in. Her work done, Johnson takes a few minutes to shoot the breeze with the agent and soak in the details. She also has a keen eye for detail. Here, her practiced eyes zone in on the kitchen cabinets. She traces her fingers, darkened around the nails from gardening, along the beveled edge of one of them. Another not-to-be-missed detail is the garage. Decorative atrium windows top the two doors for the cars. Next to them is a third door. The house is “staged,” in real estate jargon. It’s full of furniture that doesn’t come with the sticker price. The point is to give it a ready-to-move-in feel. On the living room bar, two martini glasses are set out. A glass cherry sits at the bottom of one. There were no glass cherries waiting when Johnson moved into her new home. The whole thing started with a wisecrack. Johnson was having dinner at Jimmies on Route 134 in Dennis. The owner asked whether she’d seen the house for sale down the street – the one that looks like a closet on a lot the size of a postage stamp. He said the price was $150,000. Her head spun. You couldn’t even get a condo that cheap. What’s more, her apartment building was being sold. If she stayed, her rent would go up $100 a month, to $600. So Johnson went right over to that postage stamp and peered in the windows. Later she saw the inside. It needed a heating system, insulation, new windows. It felt as rustic as a cabin by the lake. It was perfect. There had been times in Johnson’s life when she didn’t have that. The Worcester native has lived on the Cape 22 years, 17 of them working as an administrative assistant at a Brewster church. She treasures the Cape, but five times she’s found herself homeless here. The first time was in 1982. She was working as a breakfast and lunch cook. She had a winter rental that went up by $500 in the summer. Unable to afford that, she moved with her 10-year-old son and 4-year-old daughter to Shady Knoll Campground in Brewster. The kids slept in a pup tent. Johnson had another tent for her and the clothes. She was the only one at the campground with a job – everyone else was on vacation. By last year, those days were behind her. She had a steady rental and her own fledgling business. But the company, 360photoviews.com, still didn’t earn her enough to buy a house. It did, she believes, show enough promise to convince the mortgage agent at the Cape Cod Five Cents Savings Bank to take a chance on her. They gave her a loan at $495 a month. “I believe they saw the future of my company,” she says. Her company takes her to all kinds of homes. But most have one thing in common: price. People generally don’t order virtual tours for houses under $300,000, she says. That doesn’t mean she loves all of them. Leaning on her red pickup truck after finishing the Mashpee shoot, Johnson says the home she just photographed isn’t her style. “I don’t play golf,” she says. But at the next house she finds something that is her style. She’s standing in a room on the third floor of a bay-front house in Plymouth. It’s the children’s playroom, and the children who play here must be the most popular in the neighborhood. Johnson’s camera captures a doll house, blackboard, shelves of board games, buckets of stuffed animals, a video rack, and a brown and white rocking horse like the kind you find outside of supermarkets. A giant Winnie the Pooh doll reclines in its own rocking chair. Johnson strokes the sleek blond locks of a make-up Barbie, which sits next to another Barbie with pink hair. “My grandchildren would love these,” she says. Her three grandchildren are about to visit from England. They’ve never seen her house. Johnson imagines what 5-year-old Dalila will say when she walks in the door. “So Grandma Susan, where’s the rest of your house?” Johnson says in a mock British accent. The real estate agent chuckles. She asks whether the children will be sleeping over. “Not unless they agree to do the tent,” Johnson says. “Camping at Grandma’s,” the agent says. Grandma has camped there herself. When the workers redid the interior before she moved in, Johnson slept in a tent outside. There was no place else. And outside is where she plans to entertain her little guests. She’s been anticipating their visit for months. Returning home at the end of the day, Johnson and Good Boy lead a tour of all her preparations. She’s built an outdoor playland that rivals the kiddie paradise in Plymouth. A croquet set sits at one end of the yard. A marshmallow pit – an old grill ringed by three tree stumps – is ready for making smores. A blue tent with chairs and a table is ready for eating them. And at the opposite end waits the crown jewel: a wooden trestle that Johnson fashioned in the shape of a flower house. Morning glories snake up the sides, and black-eyed susans and snap dragons sprout from the ground. A little picnic table that Johnson will put inside the flower house for the kids will complete the picture. “I basically have another two rooms outside,” she says. Johnson says she plans to spend the rest of her life here. The house – close to the senior center, close to shopping – has everything she needs. Well, one thing would make it absolutely perfect, she admits. A laundry room.